As the first snowfall reaches the Scottish Mountains this week, I thought I'd share a yarn from January 2015 that I wrote up for the BMC's Summit Magazine, published under the title "White Lines" in winter 2016. It's about a bit of an epic in the hills north of Glasgow. This one is for the Scottish Mountaineers. Enjoy the coming season - everyone - be safe. Our story begins not on the hill or in the layby, but in the weeks before, riven with storms and early season indecision. Attempting to make a square peg match a round hole, to find a weekend free of responsibilities to coincide with weather that doesn’t threaten life and limb. No amount of pushing and shoving at the back will make this happen ahead of time, patience is called for and I’m always left wanting. But, by a Monday in January a plan had formed. By Wednesday my two cohorts had bailed. By Thursday the avalanche forecasts all read red or black. And by Friday the update promised a window. Small, but as imperfectly perfect as I could expect. I moved choice of venue east a few miles and left Glasgow at 6am the following morning. Heavy snow in the headlamps on a slippy A82, no wind and low fog in the plantations above Cranlarich. I found my pace and adjusted to snow muted silence after weeks of distractions, content for now to see how far the weather would allow me to get. A winter camp and photos of sunset and sunrise would do I suppose, though I hoped for a full round of Cruach Ardrain, Beinn Tulaichean, Stob Binnean and Ben More. I waded through the rides at the end of the forestry track and onto the open hillside, kicking through crust to frozen turf as the cloud smeared away to expose a watery, white and heatless sun. I played relay with 2 groups out for the day – 2 southern gentlemen up for a long weekend, and 3 likely lads from the Edinburgh suburbs who consistently outpaced us all. One of the things I love about the Scottish Outdoors is this ecumenicalism – up here this isn’t just a middle class pursuit, it really is ‘sport for all’. These winter hills are a great leveller, a place where action speaks louder than words, but neither speaks louder than place. The cloud hugged the ridgeline all the way to Meall Dhamh, an approach chosen for it’s offside angle to the avalanche risk on the northwest. I used to fear whiteout conditions, but now relish the navigational and sensory challenge, especially after a week of high winds to firm up winter’s macro textures. The gents catch me at the top, where we emerge from the inversion. A fogbow: My first, and theirs too. I imagine these old timers might have seen it all, but natural wonders never cease, and thankfully they make children of us all. I left them there and glissaded a few tens of metres. The ridge had taken longer than planned. I considered my options, but the sight of Cruach Ardrain in its dazzling winter getup was too much to bear. Time was still on my side if the weather held, so I climbed, meeting the Edinburgh contingent in high spirits on their return. Summit winds blew hard and cold, Ben More and Stob Binnean appearing as soft, impressionist paintings above the cloud. I descended into an ultraviolet dusk, left my bag at the bealach, and wandered to the top of Beinn Tulaichean as darkness took. Fiery oranges and purples gave way to delicate pastel pinks and baby blues, then to indigo, royal blues and the veiled grey-whites of a sub zero winter’s night. Hot water wasn’t forthcoming. I dug a platform for the shelter, pitched my tarp on the lean and attempted again to nurse my ailing stove back to life. Eventually, the pump spat out its rubber seal, but not one ounce of heat. I pulled on the puffy gear and sorted through my edible supplies: A tin of mackerel, originally destined for the cous cous, half a chapatti, a few oatcakes, a chocolate bar, 2 muesli bars and a 100gms of hard cheese. The dried goods were ballast now. I wasn’t going to starve, but fluids were more of a concern. No soup, tea or coffee. Maybe a 100ml of water in the Nalgene, still in liquid form for now at least. Maybe an early night would be best. 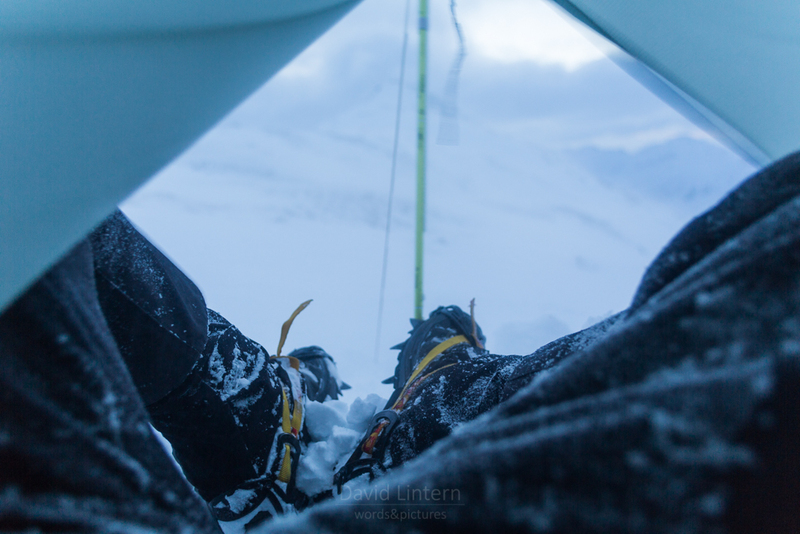 At 8pm I settled to sleep, and noticed distant avalanche rumble… At 11pm the winds picked up and I dug the snow over the shelter bottom to prevent spindrift entering… At 4am, I awoke again, an almighty hoolie blowing, shelter walls contorting. At least 3.5 hours till first light. Evac? I’d rather procrastinate. The temperature had risen a little and the centre pole had drilled a hole 4’’ into the snow. I stuffed the empty mackerel tin under the pole. 10 minutes later the pole had drilled another neat hole right through the tin. I had better luck with my crampon bag. The pole continued to bow unnervingly, despite the increased tension – a lightweight model made for short alpine hiking trips, it simply wasn’t built for this abuse. By 6am stress fractures appeared on the joins. I readied myself for the inevitable, dragging heavy limbs out of layers and into others and returning to my bag. Around 7am it bowed for the last time. I was ready and prevented a rip in the tarp fabric. For 20 minutes I lay with the shelter in tantrums on top of me, and considered going back to sleep. Getting up now seemed marginally preferable to slow suffocation from drifting snow. Propping up the shelter with head and shoulders, I began to stow my kit. Forced every few minutes to lie down to release the pressure of wind blown fabric on my neck. At least there was no breakfast to fuss with – just the last dribble of water and half a muesli bar. Where are we on the fun scale now? Somewhere between a type 2 and 3? Am I mountaineering yet? I hauled myself and my bag to the door, and fought an epic battle with icy crampons and cardboard straps. Abstractly I found it pretty funny how long everything takes in extremis. 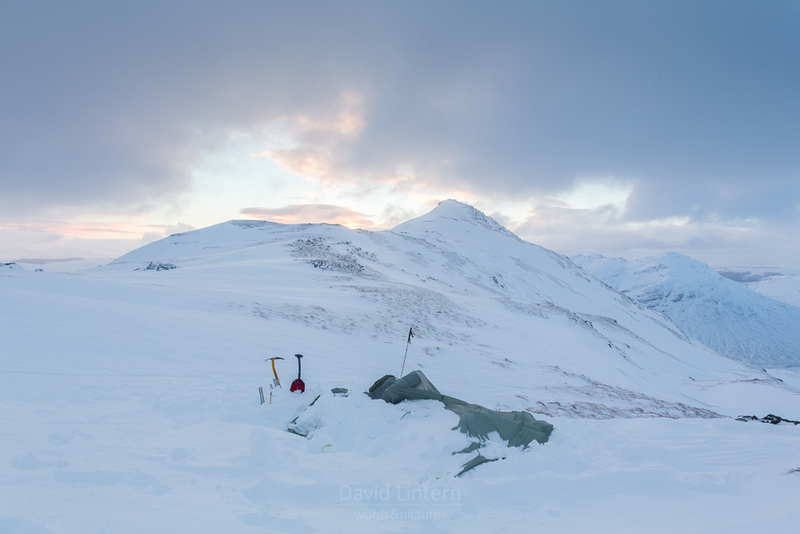 I was still digging the shelter out as the sun rose and christened the tops of the An Caisteal group to my left. The wind seemed to drop a little. I took a few pictures and began my decent into the Coire Dudh; thirst on my mind, into pristine fields of deep drifts and layered crust. Spindrift dervished on the surface. There was no wind slab here to speak of. Now, full sunlight hit the tops of Cruchan Ardrain, Stob Garbh, Ben More and Stob Binnean. This is the part where I pay my respects, my Sunday Service. Maybe. I’m not so sure about idol worship, my relationship is always changing, but like so many others trip-by-trip I’m writing my own humble story of the Scottish winter hills – hours of discomfort interspersed with splintered minutes of transcendence. I reached an open burn, to rest and drink. What next? Should I give up on my plan for the round and wade through waist high drifts for a few hours, or face a steep scramble on the west wall of Stob Binnean? The weather was hugely unsettled, repeated snow showers raced across the skies. I um’ed and aah’ed like the amateur I am, my prevarication grating. A professional would decide in minutes or less, and have more time in hand to work with. A little more wading decided the issue. I do at least know to trace my route carefully beforehand: First, to the big crag, then the lone birch, then the ice field, the turf ramps, to the crag wall, to top out. Initially, it’s easier than wading. There were beautiful convex fields of ice to walk across, then crusty turf, but quite quickly now the lack of food begins to tell. An occasional bite of cheese or chocolate failed to provide the necessary energy. The angle steepened and I dropped to all fours, daggering with the axe. I’d wrongly assumed from the glen that the upper crags were islands of safety, but instead they harboured deep slots concealed by snowdrift. Brought to a halt every minute or so, cursing the weight of the bag and my lack of strength. If this is what two missed meals does to me, what must Doug Scott have dealt with!? Why waste time with this pointlessness and not spend it with partner and daughter? Not appropriately ‘psyched’, no doubt. Indeed - for a few seconds doubt is the only thing not in question. There’s more physical comedy and cursing near the top of the crags, as I scrabble along an icy shelf with scant purchase, the snow shovel on my pack catching the rocks above my head. Reserves are found, as is more turf to drive the axe into, I hang on tight and top out onto another bubble wrap ice field. Are we nearly there yet? Nope. Ankles ache to be released from spikey medieval torture tools; I’m beyond able to catch my breath. Can I get a witness? Trot on, little man. At the crest at last, contorted cornices are framed against an angry blue bruise of a sky, and the wind freezes the snot in my nose. But at least the octopus tentacles of doubt slither away from the edges of my consciousness – there is no more up! Turning into the wind to the north, I ask the ridge to take me home. A staggering old man hobbles northwards. A return of those tendrils of uncertainty on the short approach to the summit of Stob Binnean, which I reach at 4pm exactly, bent over pole and axe against the wind. There are sunset histrionics on my left, which turn the heavily rimed rocks a science fiction amber through these goggles - Marvel’s The Thing! It might as well be Pluto up here. A few more measly metres, and the bealach lurches into view. But it’s me that lurches. The wind actually screams here, and I’m sure the ice is groaning, or maybe it’s me … but down into the gloaming I go, heels first, fantasising about taking off those bloody steel spikes, finding water again and the track to the road. Was this mountaineering? Was it technical enough, did I suffer enough… or did I make a mountain from a molehill? Oh, the vanity! None of us need apologise for someone else’s idea of epic. Call it what you want, the labels don’t matter. This is Scotland in winter, where the lines blur between disciplines, and thank heavens for that. They are also my hills now, the best risky play I can enjoy without being naked or high. Out there I’m both of those anyway. Personal reflection is vital, but we’ve nothing to prove to each other – only ourselves. So enough of all that. The more interesting question is always the same - why bother? Why go to the mountains? I still ask this, and maybe that’s as well. For those moments in-between the non-sense, is my reply. For the value I place on being in the midst of a beautiful, unsolvable puzzle. Because I’m lost without them, and lost within them.